Notification----Remember to always check your notifications: When you are mentioned (@John Doe) in a discussion thread or receive a response to a message you will be alerted through a notification and it will—You’ll get a little popup on the bottom of the page and the notification will show up here. Discussions---all the discussion/question posts that you created will be stored here as your personal archive. 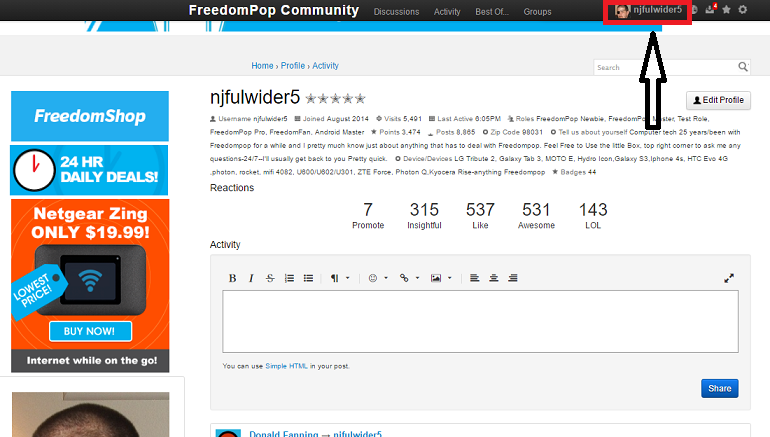 Comments----Every time you write a comment on the FreedomPop Community, it will be stored here as well. This has the information you used when you edited your profile for everybody to read-You find stuff like: username, Joined, how many times the profile was visited, Your Roles, and all the little key bits that make you you. 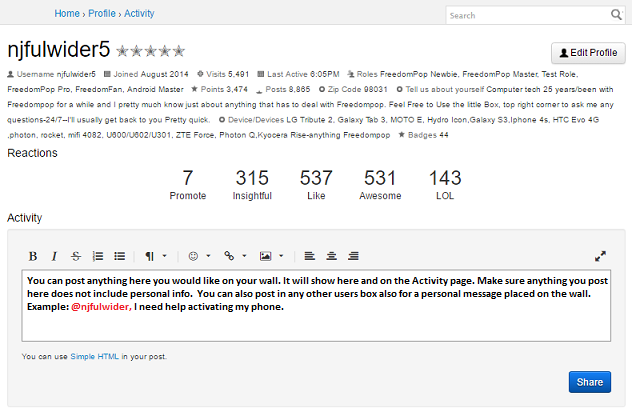 This is the place that show all the points earned since you have been with our "FreedomPop Community". Your personal activity box-when other members write in your box, you get a notification on the activity page and it shows on your activity wall. Great place to blog, share info or another member to ask you a quick question (write in the box and when you're done-click share) this gets confused for Private messages all the time.-Not a PM and everybody can see.-(Make sure if you want to PM the member you click the Message box and Not the Activity box)Box says edit profile when its your account, and Message when you on another members profile page. What about the "New Items Count"? How do you know what items/discussions have a new comment. I've tried clicking through all of the comments listed and the "count" remains the same. Please delete my forum account.